Working hours: from 10 a.m. to 7 p.m. 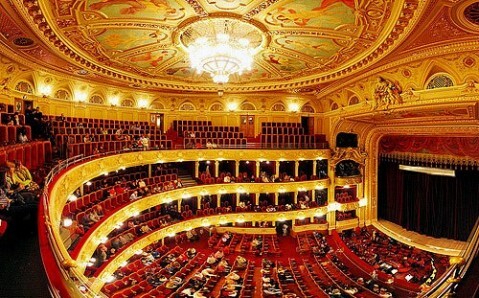 The Theater of Opera and Ballet is one of Europe's most beautiful theaters on par with Vienna and Odesa Opera Houses. 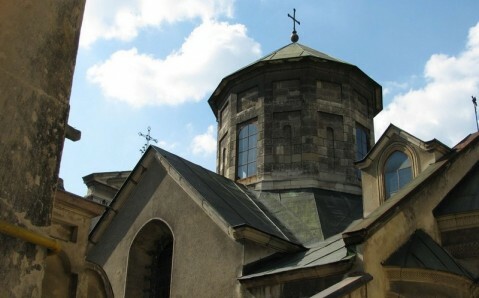 Local residents often call its gorgeous building Lviv's main symbol and gem. 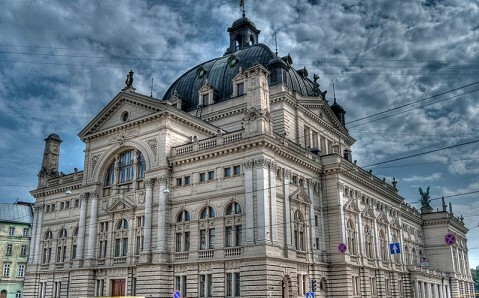 Lviv Opera House adorns town's main avenue and is one of its brightest sights that should be visited without fail. Daily thousands of tourists from all over the world admire its beauty and splendor. 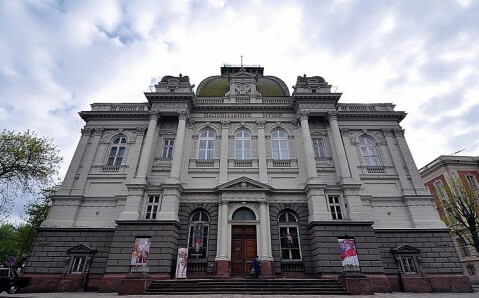 In the late 19th century, when it was under the Austria-Hungary rule, the necessity of having the large town's theater in Lviv arose. At the same time, an open bidding was announced for the future theater's best design, and talented architect Zygmunt Gorgolewski, who had already become famous for designing several monumental buildings in Germany and Poland, won it. It was decided to build the theater at town's center, which had already been densely built on. To solve the problem with place, the inventive architect suggested 'hiding' the Poltva River, flowing through Lviv's center, under the ground, in town's sewer, and using durable concrete vaulting instead of conventional foundation. 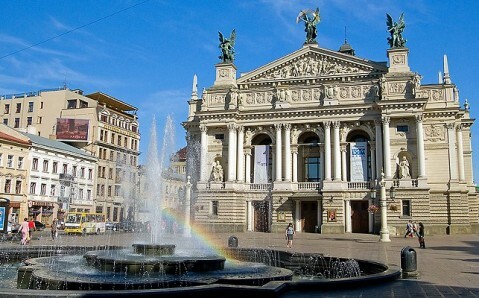 Therefore, we can safely state that Lviv Opera House is the only theater in the world built on the river. Its construction started in 1897 and lasted for three years. In the year 1900, the Large City Theater - opera's former name - was solemnly opened. Carried out in classical style with inclusions of daring baroque and reserved renaissance, the building amazed with its spectacular and luxurious decoration: the best craftsmen from Lviv and the whole Old World worked on its design and decor. 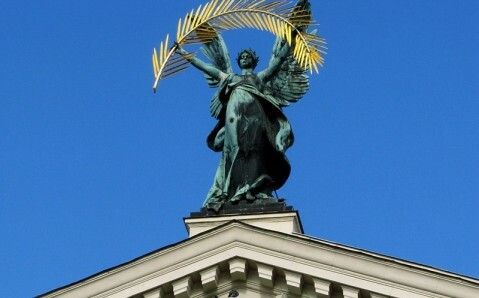 Building's facade is richly adorned with sculptures, pillars, niches and balustrades. It is crowned with three winged bronze statues - Genius of drama and comedy, Genius of music, and Glory with golden palm branch in hands. Theater's interior is designed in such way that its lobby, corridors and stairway are lit with natural light as much as possible: with sun during the daytime and with moon and stars at night. 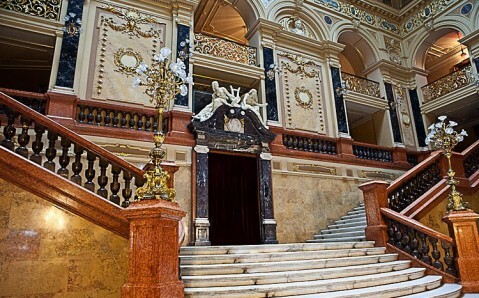 Lviv Opera House's interior charms with beauty and magnificence of its decoration. Several kilograms of gold, variegated marble, mind-boggling paintings and sculptures were used in its decoration. Theater's guests are particularly amazed with mirror hall, which got its name because of mirrors that are placed opposite each other and create an illusion of an endless tunnel. The corridor is decorated with pictorial pictures depicting allegory of the continents: Europe, in image of a white boy, travels from one continent to another and receives various gifts from them. 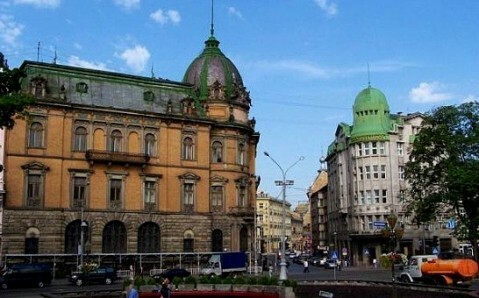 In 2000 - to its centenary - Lviv Opera House was restored and renamed in honor of Solomiya Krushelnytska, the prominent Ukrainian opera singer, famous worldwide. 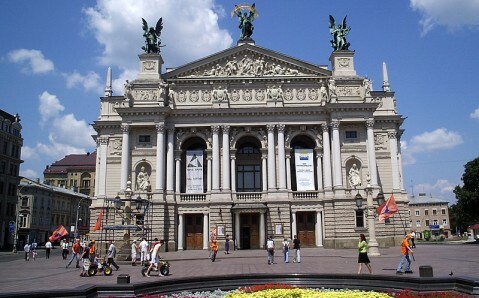 It is worth visiting Lviv Theater of Opera and Ballet not only for a performance, but for an excursion too. It'll allow you to learn more about this marvelous architectural monument's history and its legends.